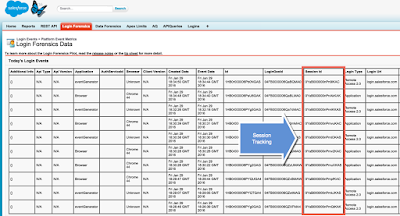 Are you a Salesforce Shield or Event Monitoring customer using the Event Monitoring Wave App? Do you know it's pretty easy and - also very quick - to create custom views to the Event Monitoring data? Mike Smith, Salesforce App Cloud Solution Engineer based in Denver, Colorado area is an expert with Event Monitoring and in this short video below Mike will demonstrate how quickly you can create a custom dashboard with Event Monitoring Wave App for Logins in the last 7 days. Have you been exploring the new release with Event Monitoring? 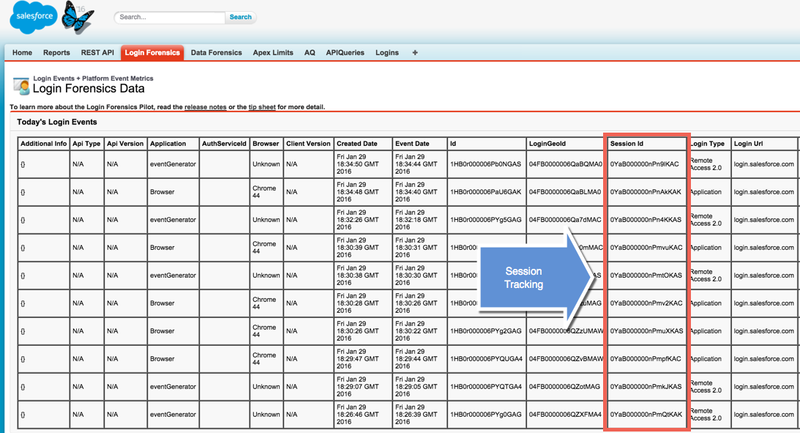 If so, you might have seen the Event Monitoring event log lines that contain Login_Key and Session_Key columns. These are new fields that tie together all the different events in a Salesforce user’s or admin’s login session or activity session, respectively. Purpose of the Login Key and Session Key fields are to help provide specific identifier for a user’s login session across various log lines to give customers a better 360 degree view of users behavior within the Salesforce application for a given security investigation, understanding and exploring specific user behavior or when researching a specific application or performance issue. Let’s see them in action. 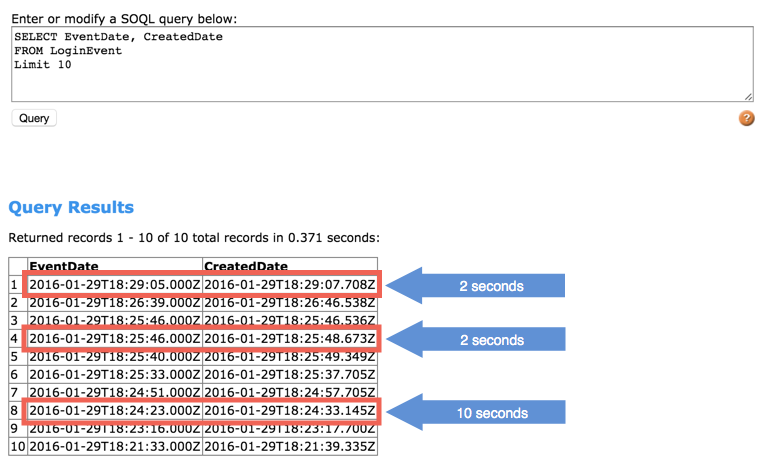 Here's an example showing URI event logs - in other words, users’ click path in the Salesforce application across the various generated log lines. To easily see a more concise view of what each user is doing, you can now use LOGIN_KEY as an identifier across the different Events to tie them together as well separate different actions together with this powerful identifier. 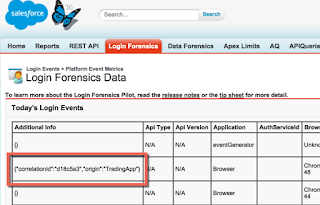 Please see from the picture below and example of the LOGIN_KEY field within URI event logs. So how can you best take use of this identifier? I’ve collected couple of examples here, please leave your thoughts and additional ideas to the comments below. 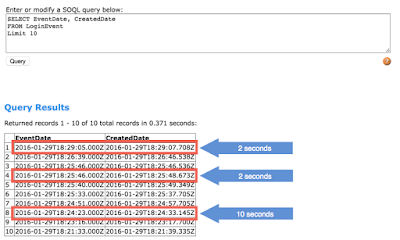 Your application can generate a ton of URI log lines. When researching for specific user’s log lines, you might easily run into issues of finding the needle in the haystack. You can use LOGIN_KEY as grouping mechanism to separate different user sessions and volume of activity. Looking at URI (i.e. page views) for example in this picture below, we’ve aggregated all URI Logs for user Jari Salomaa on September 23rd. 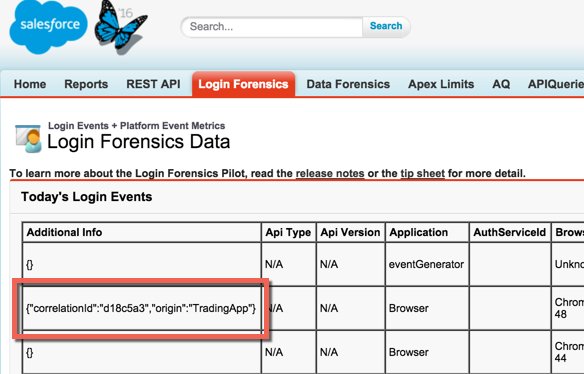 We can see there’s 5 different LOGIN_KEY’s that separate the different sessions ranging from logins from Salesforce1 Mobile, Safari, Chrome browsers from which, there’s over 200 log entries for one specific Login session that we can click and expand and investigate more closely what specific pages those URI logs contain. Additionally for the security conscious customers, whether on Sales Cloud or Service Cloud or other Salesforce products, understanding data export activity is always important. Who is downloading customer data to their local computers and especially if that happens in very large volume. As an example building real time alerts and policies is important when there are large volume data export activity taking place from different hours of the day outside the typical business hours. This is often the case with compromised credentials and different hacker groups placed in different countries like Russia, China and Eastern Europe targeting valuable data. If you don’t have business users logging in and exporting data in these regions you can use LOGIN_KEY and SESSION_KEY to better understand past behavior against different timezones your business operates. For more details about supported events, see the SOAP API Guide for additional updates and details, which is updated each release. Thanks for Melissa Kulm, Mike Jacobsen and Lakshmisha Bhat for their invaluable feedback and comments on this blog. Please feel free to leave feedback below! Mark your calendars and come join the session about Event Monitoring and Field Audit Trail on Thursday 6th October at 3.30pm - 4.15pm at Moscone West. We'll have also Yousuf Khan, VP of IT from PureStorage to present their case for Event Monitoring project for their Salesforce application. We'll provide latest roadmap details and insights how to get the most out of your Salesforce application for security and compliance monitoring, application development and performance monitoring as well as user behavior and adoption monitoring. We'll highlight also some of the exciting ISV vendor solutions built on top of Event Monitoring APIs to help you analyze, optimize and grow your application securely. Remember also to check out the latest Salesforce Shield and Event Monitoring demos at the Salesforce Expo Campground during the conference. We'll have staff to answer any questions related to using the analytics APIs for logs, Login Forensics and Transaction Security policies for customers and partners. Details about the Event Monitoring session available here. You might be additionally interested to check our Platform Encryption - Bring Your Own Key session. See you in Dreamforce! Hope you have a great time! Hey there! Salesforce Shield and Event Monitoring expands from Event Log API to built in, out of the box data visualization with Event Monitoring Wave App. Now Generally Available (GA)! Big thanks to Adam for all the heavy lifting with the Admin Analytics pilot (former name). If you missed the announcement from June, here's the deal what you need to know. My Trust: inspired by trust.salesforce.com, My Trust is a single place to view the health of your Salesforce app, active users, total transactions, average and max page time and end user page time. Drill down to different event types and compare daily trends. We hope you enjoy the app and will find these built in visualizations useful. You can use your 10 permission set licenses as viewers or editors/managers. If you require more users or are nearing the 50 million limit you can get in touch with your Account Executive to get more with Wave Platform. If you are an existing Event Monitoring customer and haven't yet tried out the Event Monitoring Wave App: please follow these instructions to get set up. If you're new a customer interested to learn more about Event Monitoring and the Event Monitoring Wave App, get in touch with you Salesforce Account Executive to get started. For anything else, please leave questions or comments here or reach out on Twitter to @salomaa. Thanks and sunny summertime from San Francisco!